The more legal services they had, the better they fared, experiencing reduced symptoms of Post-Traumatic Stress Disorder (PTSD) and psychosis, spending less money on abused substances and having better housing situations, the study found. In addition, the study concluded that mental health was improved even if veterans lost their legal battles. 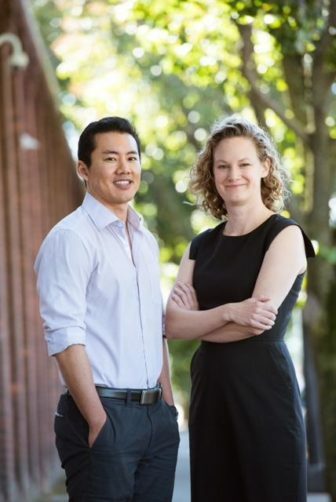 Jack Tsai, an associate professor of psychiatry and researcher with Margaret Middleton, head of CVLC. The veterans’ most prevalent legal needs related to: VA benefits; housing, such as evictions; family issues, such as child support and divorce; and consumer problems, including credit card debt. Sidley Cousins, 38, a Navy veteran with bipolar disorder, said his mental health improved after getting free legal help and that he is planning to be married. Cousins, who works in security in East Hartford, said the Connecticut Veterans Legal Center helped him obtain a divorce, VA disability benefits and a settlement after his car was stolen. “They helped me tremendously,” said Cousins, of New Britain, who served from 2000 through 2004. Nationally, there are 15 medical/legal partnerships between the VA and legal services organizations, according to the study by lead author Jack Tsai, an associate professor of psychiatry at the Yale School of Medicine and a core investigator for Veterans Affairs, New England. The study was published in Health Affairs on Monday. There are 168 VA medical centers and 1,053 VA outpatient clinics nationwide. The study shows a need for more partnerships and for proposed federal legislation that would provide funding toward legal services given at VA facilities, said Middleton, whose legal center is based at the VA Errera Center in West Haven. Her organization helps veterans who have faced homelessness and mental illness with legal problems related to health care, housing, and income. The VA has issued guidance to its medical centers on working with community legal providers, but it has put “little focus on civil legal problems that can affect health and impede recovery,” the study states, adding that in surveys, veterans consistently report legal help among their top unmet needs. Of the 705 Connecticut veterans included in the study, most were single or divorced, white males earning less than $21,000 annually. Twenty percent served in Iraq or Afghanistan.